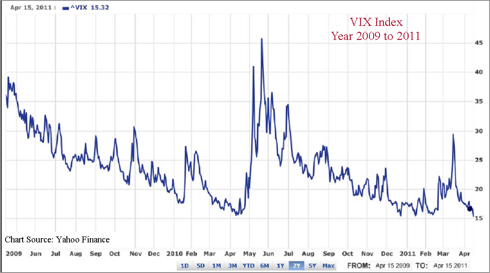 If we look back at last year for guidance, we remember that the Greek and European crisis was known for months, and the selloff only occurred when conditions were optimal. As in: the Fed removing stimulus from asset prices, which led to limited upside gains versus substantial downside correction losses. Then, all of the sudden, we had a crisis on our hands, only differentiated by the fact that sellers stepped into the market, and all the sudden, bad news was everywhere. It is only bad news in market terms if buyers decide to sell, and just like in 2010, the above reasons serve as likely catalysts for similar selling this year around this time. Think along the lines of a 20-25% correction in most asset classes over the next 4 to 5 months. Just think how much better your portfolio would look if you locked in your profits last April, parked your money in a money market fund, waited for the summer selloff, and then got back in the market during the historically stronger investment months for the last quarter of the year (October-December) when money managers push up asset prices into the year end to make their numbers. I don`t recommend trying to get defensive as even your dividend stocks get hit during a prolonged 20% correction like we had last summer starting in late April, and eventually scarring policy makers into putting together another stimulus package to avoid a potential double dip recession. The conservative investor should just go to cash in the form of some kind of money market fund, lock in some nice gains from this Bernanke-created Asset Inflation Program, wait for the substantial summer sell-off, and when it appears the selling has subsided, then get back into the market. The critics are right that you can never perfectly time the market, but getting the bulk of moves is what is important, so you miss a few exact tops and bottoms. But you can take profits after considerable run-ups when reasons for the run-ups change, protect capital, and plan to re-enter, once the new levels of life without QE2 are established after the correction. A good ballpark number would be 20% from current levels. The alternative, to just keep your money in the market at all times, is an unattractive option in this era as the ten-year returns for just staying pat is basically flat to negative depending upon exact comparison points. In short, the buy-and-hold strategy has been dead for at least 10 years (see S&P 500 chart); you have to try your best to time markets these days. 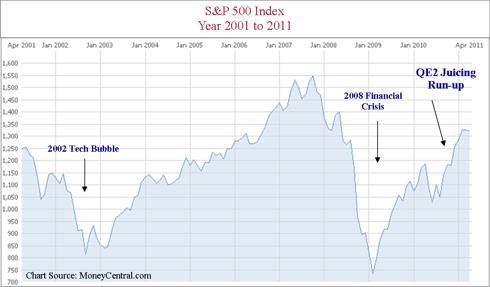 We are in the era of trading, firms go bankrupt, companies get kicked out of indexes. We live in a volatile world where the value of assets is constantly changing, asset prices go up and down, and investors need to constantly analyze their portfolio, and the landscape surrounding their portfolio, to assess whether changes in the environment could positively or negatively affect their positions. Just keep in mind another old Wall Street adage: "No one ever went broke taking a profit" even if sometimes it is a little too soon. Make no mistake, there will be no QE3 anytime soon with gasoline prices and inflation concerns bubbling everywhere. The Fed`s hands are tied with this one, they will be lucky to get through the rest of QE2, (have you seen silver prices lately?). So, the inevitable selloff is just around the corner, and it will be a massive downturn in all assets that were inflated. Remember, that was the goal of the Fed: to inflate assets. Well, once the stimulus is taken away, the assets start to deflate, and throw in some profit taking, new found short enthusiasm, and no more Bernanke put to embolden dip buyers, and voila! you get a sustained correction. Don't listen to those pundits who say the market will be fine without QE2 stimulus, that we might only get a minor correction of 2-3% this summer. I have watched markets come and go, and there has been a night-and-day difference in the way assets traded before QE2 and how they are trading currently. One thing is for sure: the markets are trading 'artificially', where the same news about China tightening, or a European downgrade, natural disaster, or poor economic report is ignored and quickly discounted. The reason is that there is this massive injection of stimulus occurring every month to 'artificially' prop up asset prices. The best analogy I can give is the "Juicing Era" in baseball where all of a sudden a productive home run year would be 35-40 home runs for a player turn into 75 going over the fence for these same players. We had skinny shortstops all the sudden hitting 25 home runs. Once they implemented a serious anti-steroid campaign, i.e., the stimulus was removed, all of a sudden the home run numbers went way down. When you inject Fed monetary policy that is artificial, it gets in the way of normal, healthy legitimate two-sided price discovery of assets and markets. Once the 'artificial' is removed, markets will go back to normalized price discovery, and bad news really is bad news again, just as skinny shortstops go back to hitting 7 home runs per year. h about day trading ?